Summary: This is one of my favorite local trails with or without the kids. My friend first took me a few years ago, promising that I'd see something really unique if I kept my eyes open. Sure enough, about 15 minutes in, I sawthe ghostly remains of an old cotton factory through the trees. Minutes later, we had crossed the rapids to explore the old foundation. A great river walk with some adventure mixed in, what's not to love? 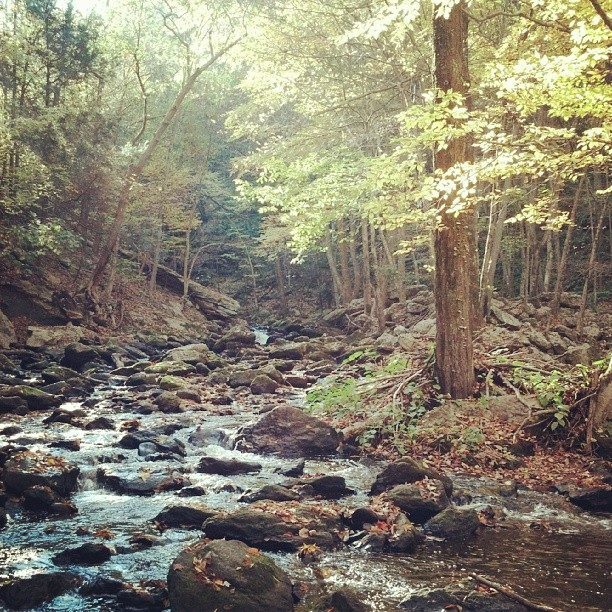 (All square pictures are from on of my first hikes there a few years ago). I typically park behind a Tavern right off of Rt. 17, across from the road that takes you towards the historic ferry (Water Street?). Disclaimer: I really only like to take my dudes hiking where I know there will be friendly water (suitable for wading). I find that for kids under 5 there needs to be a draw besides the hike itself and some vistas. Some place to get wet and throw rocks is a huge plus and 99% of the time my trips take us to a pond, a river, a lake or the ocean (Bluff Point is awesome by the way, I'll write about that later). That being said, this hike picks up along Roaring Brook which, depending on the season and how much rain we've had, may or may not be roaring. In our case, it was low which meant there were lots of exposed rock bars, perfect for letting the guys dig in the mud and throw rocks for a while. They could wade in and out of the water without any worries for most of the beginning of the hike. We followed the trail along the river for roughly 10-15 minutes. It's flat packed earth with some roots. The trail then rises and you realize that to your left is a good 50 foot drop to the river below. I told my four year old to hang to my right and I had my 20 month old on my shoulders for this part. If you're hiking alone with your kids, I recommend keeping the younger on your back or shoulders for this part. After a few minutes there's a sharp, single track decline to your left that beings you back to water-level. You're on a rock and sand bar now that's pretty wide and safe. It hasn't been under water in the many times I've gone. 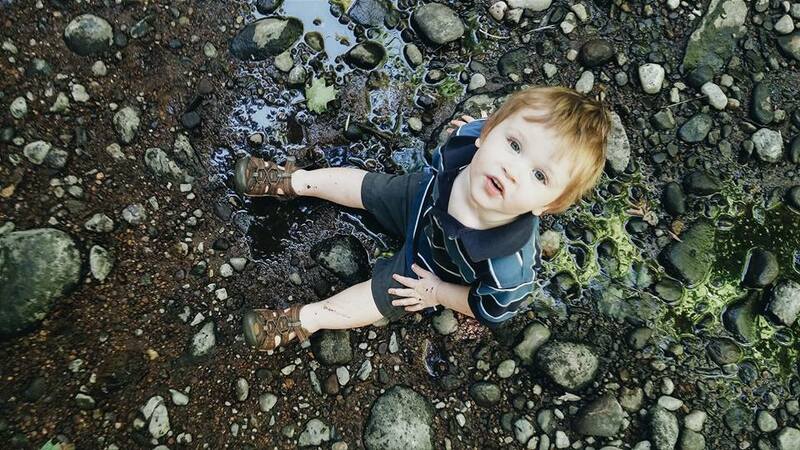 The river is a bit faster here but kids can still wade in a few feet if you're with 'em. Now you'll see the old cotton factory from the 1800's that burnt down some time ago. It's really one of the most unique things I've seen hiking in the area and is worth some pictures and exploring, if you can get to the other side of the river (there is a way to hike on the other side of Roaring Brook and I'm sure Google can tell you where to pick up the trail for that side). That's a good stopping point and a great place to break open some snacks and drinks (you did bring a lot of water right?). For the more adventurous, feel free to continue on to that large rock wall you see in front of you upriver. Here you can scramble hand-over-foot and cross a small stream to venture further up the Roaring Brook. Another few hundred feet over a rock garden and some dried out logs from high waters you'll come to a smaller packed dirt "beach" (pictured above). There's a great swimming hole here (not for kids!) that offers a tremendous view of large rock slabs (the opposite bank rises about 30 feet) and shallow rapids up and down the brook. More rock throwing. If you're alone, you can shuffle along that large exposed rock face behind my kids and sit on the big boulder back there to watch a pretty cool water chute leading into the swimming hole. This spot is particularly special in the fall, when you can catch the leaves falling and catching spots of light all up and down the river. Mesmerizing. The rapids here were pretty shallow so we carefully stepped into some of the narrow chutes where Eli could watch leaves disappear through mini-waterfalls and Sam could let the water push against his belly a bit (while I held him of course). Overall this is a beautiful place but can be a bit spotty for young walkers at parts. It's worth it, if you ask me, but take your time on the rock gardens and keep the kids opposite the drop when the trail rises above the river. Ideal age for this hike is probably 5-7 years old with younger kids on your back. If those spots worry you, it's almost worth it for the first 10-15 minutes along the Roaring Brook! Finish off the hike with a trip to the historic ferry and a coffee/drink from So. G. Coffee Roasters. Also worth mentioning is Rose's Berry Farm...that's a whole post in itself but get over there for an amazing fresh berry brunch (super early to avoid the line). Let me know if you go and tell me what you think! Older PostDay Trippin': New Site!